Nanteos Mansion in Ceredigion has announced a new name for their restaurant, yrEos, alongside the launch of a new spring menu. Eos means the nightingale bird, which reflects the nightingales that once lived near the stream on the estate. The new spring menu includes starters of salt baked beetroot and cured pork belly, with starters priced from £7. Main courses include cannon of Welsh lamb, Welsh lamb navarin, traditional fish and chips, slow cooked rib of beef and Welsh rib eye steak. Main courses are priced from £13.50 to £23.50. Built in 1738, Nanteos is a beautiful 22-bedroom Georgian house located on a 30-acre country estate close to Aberystwyth. The estate consists of woodland and private parkland and the historic house sits against the backdrop of the rugged Cambrian mountains. The hotel boasts unrivalled views of the lake and surrounding Welsh countryside. yrEos is open for lunch, afternoon tea and dinner every day. Sunday lunch is served from 12 until 2.30pm, with a traditional roast that changes weekly. Head chef, Gerwyn Jones, began work at Nanteos in 2013, under chef patron, Nigel Jones. Gerwyn went on to work at Ynyshir for several years, before returning to Nanteos as head chef in 2016. Gerwyn is originally from West Wales and grew up in the local area, he aims to source produce from local suppliers wherever possible, focusing on the best tasting ingredients. His signature dish is cured pork belly with apple terrine which is featured on the five course tasting menu. 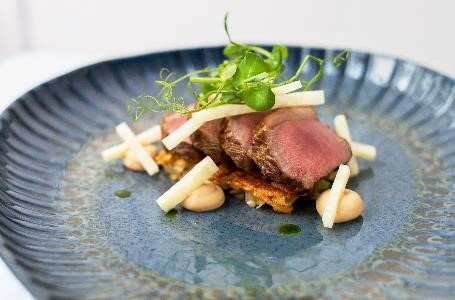 There are five and eight course tasting menus available every day, starting from £50 per person. All menus change with the seasons. For those wishing to extend their visit to Nanteos, the hotel’s 22 bedrooms offer value for money. All bedrooms are unique with elegant décor and impressive views of the grounds. Tastefully furnished with plush king-size beds, en-suite bathrooms, TVs and small sitting areas, each room has free WIFI and tea and coffee-making facilities. Bedrooms are priced from £135 bed and breakfast. Nanteos is a country house that happens to be a hotel. The building sits on the site of a house that dated back to 11th century, which can still be found with front door and windows still intact, in the cellars below the house. The flooring dates back to the 11th century with flagstones worn from the steps of previous inhabitants. The building of Nanteos as it is now known, began in 1739 under the direction of Thomas Powell, MP for Cardiganshire, funded by the wealth of his wife Mary Frederick, granddaughter of Sir John Frederick, Lord Mayor of London. In its heyday the estate covered 33,000 acres. Now covering 30 acres, guests visit Nanteos for walking breaks and to explore the countryside and coastal scenery. The property is dog-friendly and there are a number of pet friendly rooms located around the courtyard. The house is full of antiques, original art and memories of past inhabitants such as the worn flag stones leading to the breakfast room. Many of the original features remain, including the original kitchen complete with the range which is now the breakfast room. The Grade II listed Stables is now the Mews House, a self-catering property, adjacent to the mansion.